The children had so much fun at the book swap this afternoon. The gasps and wows as they walked through the door was amazing and I've been told we need to do this EVERYDAY :) Such a great thing to hear!!! The children and staff are very much looking forward to next week's WORLD BOOK WEEK, so we thought we would give you an insight into what is going on during Broadmeadow's biggest ever book week!!! The theme is #Shareastory and the aim is to get children, parents, friends and foes to join together and enjoy sharing a story. Monday- We have an exciting assembly in school focussing on sharing stories and the importance of reading. During the day, teachers will also be sharing a story with their class. Tuesday- There will be a book swap in the hall Tuesday afternoon for the children. We are still taking in books for the book swap, so please if you have any old book/s send them into school with your child and they'll be able to choose a new book/s to take home. Wednesday- No Pens Day- children and adults in school are banned from using pens today! The purpose of No Pens Day is to enable all children and adults to engage in activities that do not require writing and to explore other ways of showing knowledge and learning. Thursday- World Book Day- Dress up as a favourite book character. 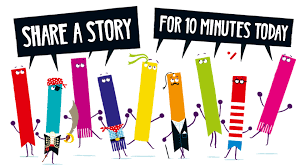 During the day, parents are also invited to the #Shareastory session, a half-hour slot where you can sit and read, discuss books and enjoy a biscuit with you child. Unfortunately, it was too tricky to set up a session for Year 6 because class teachers are out of school and half of the children will be in Kingswood, so we are in the process of arranging something for Year 6 children and parents- watch this space! Friday- The unveiling of the new library. We are so excited to announce that we have moved our small library to the huts at the bottom of the playground because our old library was so small it could not fit in a class of children and there was nowhere comfortable to sit. The new library is a much bigger space and has a 'library classroom'. The children have not yet had a look inside, so Friday will be their first visit and from then on lots of reading sessions will be taking place in there- how exciting. Also on Friday, children will be visiting the infant school to read with a buddy. A reminder... Please read at home! We raised a phenomenal amount at the book fair this year- the most we've ever raised!!! Thank you to everyone who attended and all my fantastic helpers from Year 6. This means we earned £427.54 to spend on books for our school. We have decided this year to update our dictionaries as they are a little bit old and tatty and this is all down to your generosity, so we thank you very much!! !